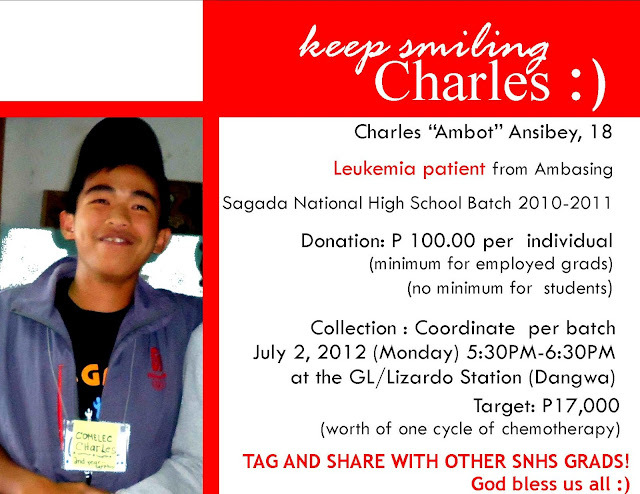 Eighteen-year old Charles “Ambot” Ansibey, is currently receiving medication at the Baguio General Hospital. A laboratory test confirms that his illness elevated to Acute Myelogenous Leukemia. He was first diagnosed with Aplastic Anemia and Myelodysplastic Syndrome. Charles is a member of Sagada National High School Batch 2010-2011. He is supposed to be a second year Criminology student at the University of Baguio but the illness corrupted his studies. Besides taking a set of pills, Charles is set to undergo chemotherapy sessions. His doctors recommended six cycles of chemotherapy, which will be completed in six months. Every cycle lasts for seven days in the hospital. Every cycle is worth P17, 000.00. This means, he needs more than P100, 000.00 to complete the recommended six cycles. During chemo sessions, he will be receiving additional medicines if the process goes not normal. One specified adds-on is worth P14, 000.00. This is only for the chemotherapy. His family still needs to raise funds for lab tests, medicines, consultations and other hospital bills. Both of Charles’ parents Marlyn/Carmen and Odasco farm in Ambasing, Sagada. As we all know, growing potatoes and legumes cannot produce tens of thousands of pesos in a snap. Charles has three other siblings. His father hails from Abatan, Buguias in Benguet. In this regard, we would like to knock at your door. We would like to solicit for your brotherly touch. We need your prayers, as well as your financial support. As agreed on June 26, 2012, this solicitation is only for the alumni group of SNHS (Bomabanga). But still, we are not closing our doors to those who like to help us rebuild the smile on Charles’ face and his tattered dream of becoming a peace keeper. Per batch: Please organize yourselves. Anusan tako paylang. Tay siya di ikakan di sinkakadwa. There are about 10 alumni batches of SNHS. There are people in other areas and countries but we are fortunate enough to have Facebook and mobile phones. Coordination should never become a problem. We are dealing with life here, so please let us help each other in reaching our batch mates. Since we have our own Facebook groups and virtual communities, please use them in informing our batch mates about this sad news. Back in the days when we were still in high school, we were taught to be concerned with our own people. We hope, we will practice that lesson now. Collection: For those who are still studying, it is okay if you think you cannot extract from your allowance. Just help us coordinate, please. But if you find some extra money in your pockets, please donate them. If you like to have a uniform amount when donating, please organize yourselves. For those who are gainfully employed, men sakripisyo tako. Menpasalamat tako tay dey datakot maka-ubla et medjo men lanoy dadlo nan ikakana. A minimum of P100.00 will not hurt. Uray adi tako bumala sin esay labi dat ta matulungan tako nan esay ib-a tako sin nay madi ay banag. Goal: In as much as possible, we would like to raise an amount that can afford one cycle of chemotherapy that is worth P17, 000.00. That should be our target. There are more than 500 alumni members of SNHS and if 170 of us are able to give P100.00 each, we will be able to beat the goal. But of course, let us not settle with that target if we can give more. Note: Please give me a private message on Facebook if you like to get Charles’ mobile number. We are not closing our options to just cash. If you know of some help that can be extended to him, please take the effort to approach him. I will be at the GL/Lizardo Station behind the Baguio Center Mall to meet with coordinators starting 5: 30 PM to 6: 30 PM. Please find time to come and meet us there. We will count the collection and we decide whether to remit the money to Charles’ family or not yet. Please please please do so. We are appealing to those who are in far places to coordinate with their batchmates here in Metro Baguio. In as much as possible, I do not like to use my personal bank account but if we have no other choices, then we can use it to accommodate everyone. I suggest that if you are very far from your batch mates, do the initiative of sending your donation via your friends or family members who are near us. For those who are in Sagada and Bontoc, coordinate with your batchmates on how you will gather your batch donation. For coordination and queries, please send me a private message on Facebook. Email me at [email protected]. Send me a PM me on Facebook to get my mobile number as well. By the way, I am Christian Lizardo Aligo, batch 2005-2006. I am currently working in Baguio City as a Public Relations writer. Charles and I both come from Ambasing, Sagada. Sala-salamat ken dakayo amin. Matago-tago tako. Please read this blog for updates. Facebook browsing is banned at our office so I will be using this blog to keep you guys updated. Thanks.